This is an incredible story of first love, heartbreak, and forgiveness. A second chance romance that will tickle your funny bone and warm your heart at the same time. Rock is a hockey playing cowboy (what's not to love?) who returns home to find that while some things have changed the intense feelings he has for Quinn have not. If anything the attraction has grown stronger than ever. Now Rock just has to convince Quinn he's willing to do whatever it takes to get another chance. I highly recommend this one. 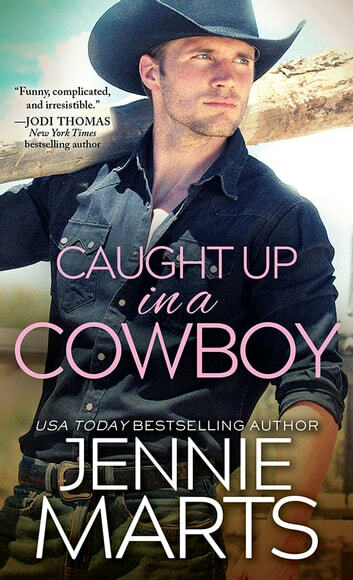 Caught Up in a Cowboy (Cowboys of Creedence Book 1) by Jennie Marts. This is Rockford “Rock” James and Quinn Rivers’ story. Rock and Quinn’s story was a wonderful and emotional ride. I fell in love with Rock and Quinn’s characters. The supporting characters were great too. Rock walked away years ago from Quinn and broke her heart. He is back home recovering from a hockey injury. Will Rock and Quinn be able to overcome the hurts from their past and find happiness? I really enjoyed Rock and Quinn’s story and laughed and cried right along with them. There were times that I wanted to knock some sense into Rock and Quinn and tell them to tell each other how they felt! In the end they figured out what was most important to them. I loved the ending and look forward to reading the next book in this series. FYI, contains mature content. I voluntarily reviewed an Advance Reader Copy of this book. Second Chance Romance, Loved it! Oh my, what's not to love about a hockey star/cowboy. I have fallen in Love with Rock, watch out Quinn. Oh, I guess it's too late for that. Rock has returned home with an injury from the NHL, when he sees his old flame from high school, Quinn. He soon realizes the mistake that he made years ago and now to convince Quinn, that this is the real thing. Loved these characters!! Rock is just so hunky and a very giving person. Quinn is a single mom but very independent and her son, Max is her number one. Max just steals the story, I just fell in love with him. This story will leave you smiling, ok I did shed a tear or two. I highly recommend this book.